Time to plant the beans! My goal with these is to can enough for the year. We eat, on average, two cans a week so that is a total of 104 cans. That’s doable, right? 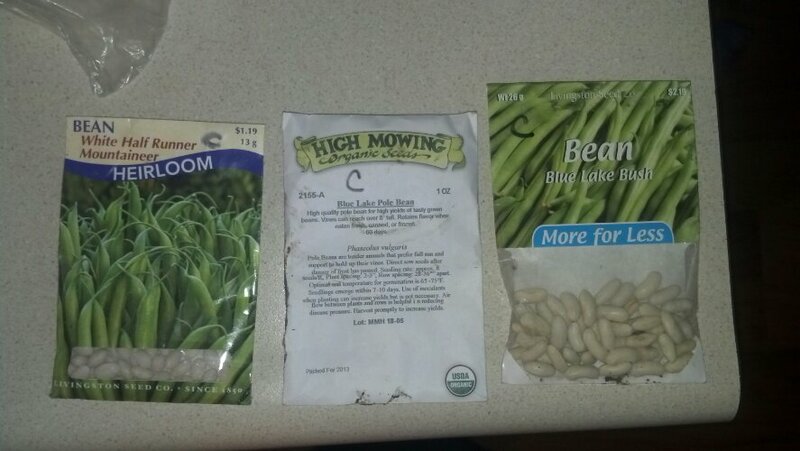 We have bush beans and two varieties of pole beans, blue lake and an heirloom. For a trellis we got two posts, and are going to put baling wire between them and use stakes to tie rows of twine on diagonal from the beans to the baling wire. We got the idea from a friend who did this in his garden last year. While I was digging the trench to plant the beans in there were two red winged black birds circling like vultures overhead. I shouted at them to leave the area at once…they ignored me. Actually, I’m pretty sure they started circling lower. My grandma told me that they will pick at and eat the seeds so I put some tulle I got at a fabric store over my seed babies as a floating row cover of sorts. From what I can tell it does the same job as a floating row cover and it is not as expensive. Especially if you can hit a sale at JoAnne Fabrics or Michael’s. I will plant the beans every three weeks and will (hopefully) have enough at canning time to meet my goal. As I’ve stated in a previous post, this year is our experimental gardening year. We are trying a lot of different gardening methods to see what works best with our land. I only set two goals: can enough beans for the year and can enough tomatoes for the year. If that is all we get, it will be a success! I hope the birds leave them alone and you get lots of yummy beans! I am pretty sure you are at least going to make your tomato quota for the year! I hope so! The plants up near the house are doing well, but the ones in the back garden seem to be stunted. I had better hurry up and get you your canning lids then. Nana always canned about 110+ quarts green beans and that of tomatoes too. The quarts are usually about twice what you get out of a can. I think you will do very good.